Serve these super crispy, tangy potatoes on the side of your favorite grilled meats for a scrumptious meal! I’ve gotten back in the kitchen, and it feels so darn good. Having a baby, you take on a whole new identity – mother, protector, teacher, constant laundry-doer. This little life needs you nearly every minute of the day. And in a strange way, it’s a wonderful feeling. Exhausting but wonderful that you have this new responsibility, and that you get to shape this person and watch them grow. It’s easy to become totally obsessed with your new role and find great joy in being a mom. It’s also especially easy to feel overwhelmed with doing your absolute best all the time. But, it’s easiest of all to forget about yourself. What I’m really saying is, there have been a lot of frozen pizzas happening in my kitchen. Things are taking a bit of a turn now, though. In baby’s mellow moments, I get to get back to my happy hobby of tinkering around the kitchen. While I don’t have marathon cooking days like I used to, it gives me a little lift to pull a hot, homemade treat out of the oven… that doesn’t have a cardboard crust. Hehe. Served on the side of a rotisserie chicken and big salad (still keeping things quick and easy! ), these scrumptious salt and vinegar smashed potatoes were a huge hit. They’re a super-crispy cross between mashed potatoes and roasted potatoes, with the perfect amount of vinegary tang. Your tiny-handed helpers will have great fun smashing the potatoes with a heavy mug, too! Try these easy salt and vinegar potatoes with your favorite grilled meats and fish, too. They’re a fun twist on the classic potato chip – and a dollop of sour cream makes them even more delish! Add potatoes and 1 Tbsp. kosher salt to a medium saucepan. Cover with water and bring to a boil. Reduce heat and simmer until potatoes are tender, about 20 minutes. Bake for 20 minutes. Remove potatoes from oven and turn each with a spatula. Drizzle with olive oil and continue baking for 20 minutes more. Once baked, sprinkle with vinegar, chopped chives, salt and pepper. Serve hot. 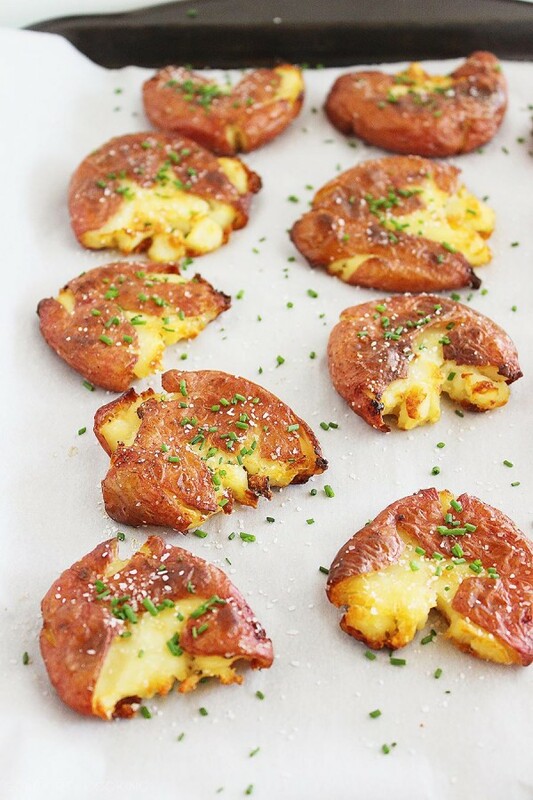 I love smashed potatoes, these are perfection! These sound totally new to me, so I can’t wait to give them a go! I’m a big potato-lover and am always looking for new ways to make them, plus the recipe looks easy and quick to put together! Smashed potatoes are one of my favorite foods EVER. So good! And with this salt and vinegar twist… YES PLEASE. Smashed potatoes are my favorite potatoes ever. They’re so crispy and delicious, and I love that you added vinegar. Delicious! Oh my gosh Georgia these look delicious! 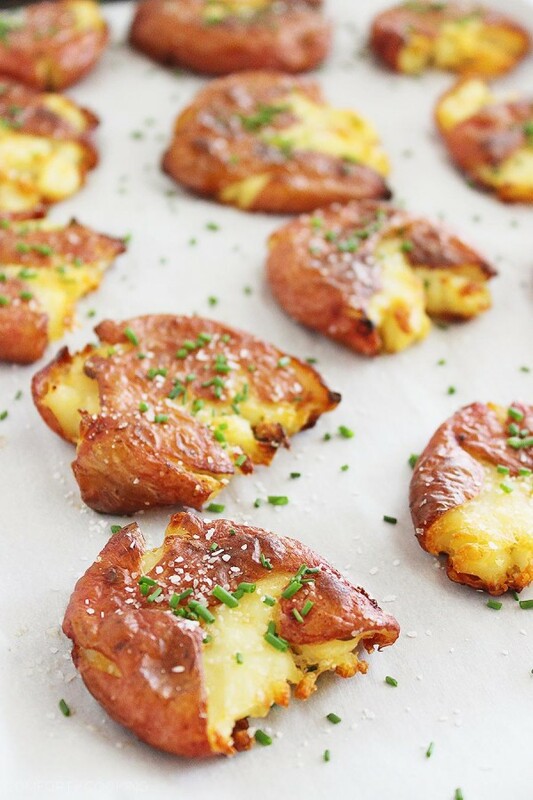 I love salt and vinegar chips so I would be all over these smashed potatoes too! Mmmm, I would love these! 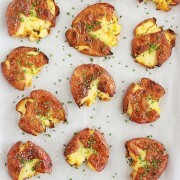 I’ve been craving salt & vinegar potato chips like crazy and now I’m going to be craving these! awesome idea! salt and vinegar has to be one of the best flavour combinations with potato EVER. definitely doing this next time i find myself baking potatoes. love it! I love it!!! Love it. These are such cuties!! Perfect for snacking or as side dish for any time of the year! Whaaaa… I’m am so excited for these. Salt and vinegar are my jam. I love how simple and easy this recipe comes together. Roasted potatoes are the besssssst!!! These look awesome! Perfect summer side for grilling and cookouts! I did these tonight with white truffle oil and apple cider vinegar… They were absolutely DIVINE with the truffle oil. My guests couldn’t stop eating them. Will def now be a staple when trying to impress friends and family, while cooking a relatively easy meal ! I made these last night for dinner, everyone loved them! Football food! These will fly off the platter! Oh these look lovely! My relatives are from England and when we go visit we always eat lots of chips (i.e. french fries!) with salt and vinegar. I will have to try these at home! Thanks Georgia! These sound delicious. I love salt & vinegar ANYTHING, and I know exactly where you’re coming from with the frequent frozen pizzas :P My son is 4 months old now and only recently did I start having enough time to cook like I used to again! Question: if the potatoes are already cooked from being boiled, why must there be 40 minutes of oven time? Why not just just use the broiler for a few minutes? I’m making these tonight. They look and sound so good from your post. Thank you! You’re welcome to give it a try! This is just the method I found produced the best result. These look amazing! 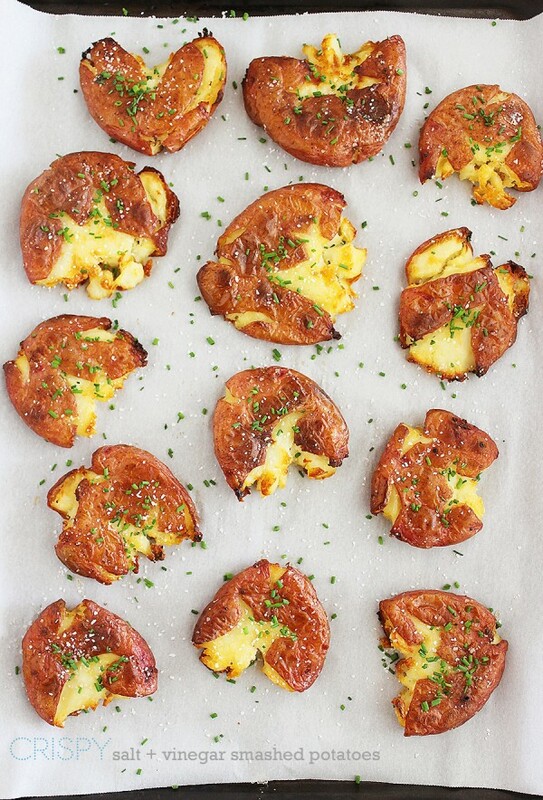 I have been wanting to try smashed potatoes and this recipe looks perfect! I have been exploring for a little bit for any high quality articles or blog posts on this kind of area . Exploring in Yahoo I at last stumbled upon this site. Reading this information So i’m happy to convey that I have an incredibly good uncanny feeling I discovered exactly what I needed. I most certainly will make sure to don’t forget this site and give it a glance on a constant basis.